Nice bright color, I like the fabric, but found it at Walmart for cheaper price. They wouldn’t match the price like they advertise. It also says requires DRY CLEAN. But all in all I would still recommend the item for purchase. Add this beautiful bedding set to your bedroom. 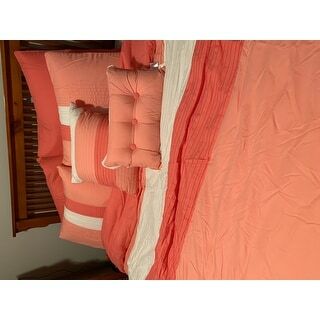 Soft and comfortable, the lovely shade of Coral this 8 Piece Set displays is nothing short of delicate class. Including Euro shams, pillow shams, a bed skirt, and accent pillows; allow this set to revamp your bedroom. This simple change will bring a whole new feel to your decor and enliven ambience. The Down Alternative comforter is hypoallergenic and the sent is machine washable for easy care. This set is also available in Sky Blue, Purple, and Blue. I absolutley love the comforter set. The color is so bright, but i do wish it had another square sham. I was excited to get my order then I became unhappy because the comforter was not long enough to be a Cal King size. If it is not a 110x102 then it's a regular King size.I will not be ordering anymore Comforter Sets until they get the right size for the Cal King. I couldn't wait to get this comforter set. When I received it I was very disappointed. It has very thin material. The batting or foam inside of the comforter shifts. The material the bedskirt is attached to is like fusible webbing you use on material. The photo of this comforter set is very deceptive. It is not plump at all. It ls very flat on the bed. I wish I had taken notice of the negative reviews. I am not sure I will buy a comforter set again from Overstock. For the money I spent I could have bought a much better comforter set from a local high end store. I love love love this comforter set. I was hesitant to buy it online for fear it wouldn't fit my California king bed, it fit perfectly and the blanket is huge and drapes just lovely on all sides! What a beautiful color. Now I just stare at it and can't wait to sleep on my strawberry ice cream cone!!!! Makes me smile everyday. I really loved the color of this set!! It’s so bright & cheerful. Quality not so much :( it’s very soft, but stitching is super weak. First 5 minutes it was on the bed one of the food seams ripped right out. This is a set for “looks”, not everyday use. The color is absolutely beautiful it goes beautifully with my seafoam green room with the curtains and the carpet it's like an oasis when I go in my room it brightens up the whole room I absolutely love it I've turned my bedroom into a sanctuary like I always wanted beautifully done. This is a great set for the price. 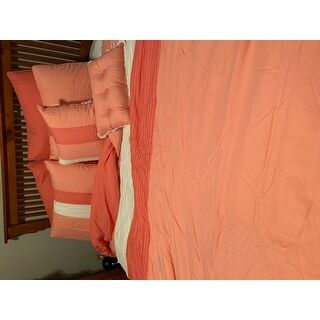 I was unsure of the colors matching the sheet set that I had already purchased but the colors were perfect. The design was nicer looking in person as well as the shams and pillows. I didn't think I'd use the matching pillows but it all looks great together. The quality of the product was very good. Great deal for the price. It is a beautiful comforter that looks very nice. The throw pillows are also of good quality. Looks exactly as displayed in the picture. I Love It..This is a really lovely comforter!! Color is not as deep as the picture but very pretty also it’s so very soft. This did not disappoint, loved the colors just what I was looking for! "Are there curtains to match this bedding set?" I'm sorry I really don't think so. It is an beautiful bed comforter set. "Are the Euro Shams sold separately?"